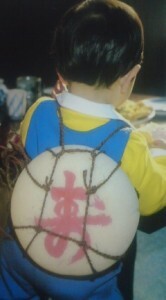 TsukuBlog | Celebrating a First Birthday the Traditional Japanese Way- with ISSHO MOCHI (一升餅), 2 kilograms of pounded rice, strapped to the child`s back! Since the end of World War II, it has become more and more common for the Japanese to celebrate their birthdays ON THEIR BIRTHDAY! This might sound strange. I mean, what other way IS there to celebrate a birthday? Well, in the case of the Japanese, instead of celebrating as they do now, with birthday cakes, presents, and the singing of HAPPY BIRTHDAY ( sung with a Japanese accent as HAPPY BAASDAY to you!) on or around the day and month on which the celebrant was actually born, traditionally the Japanese would celebrate their birthdays, or more correctly- GROWING ONE YEAR OLDER, at New Year`s with rice cakes ( mochi), and other special new Year`s dishes ( and later in their history with soba noodles). 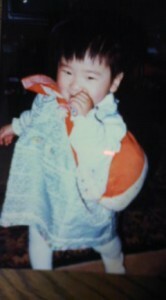 A one-year-old boy struggling to stand with festive rice cakes strapped to his back! 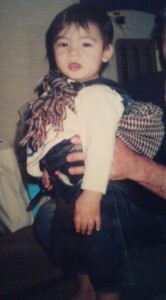 This means that on New Year`s Eve ( Omisoka), ALL Japanese used to consider themselves as having all AGED ONE YEAR . In other words, New Year`s ( O-Shogatsu) was everyones birthday! This made for some strange situations, especially considering that babies were traditionally considered to already be ONE YEAR OLD AT THE TIME OF BIRTH.Thus, a baby born two weeks ( or even two days) before the New Year, would be considered to be TWO YEARS OLD at New Years, although they he/she was in fact only WEEKS old. This way of determining a person`s age ( starting with one year of age at the time of birth) is called KAZOE-DOSHI, and is still used sometimes today when talking about when to hold certain traditional ceremonies ( such as purification for unlucky ages- YAKU BARAI ,etc.). And though nowadays it is on a persons birthday that one is recognized as having aged by one year ( this is now the legally accepted system, as well), we can still witness the existence of the old concept of everyone celebrating their age at one time each January on Coming -of-Age Day, when all twenty year olds celebrate their attainment of adulthood together on the same day. As you can imagine, one-year olds are not very comfortable with 2 kilograms of pounded rice strapped to their backs! Traditionally,there WAS one time a persons actual birthday was celebrated ( with no connection to New Year`s)- the first anniversary of birth- what we would now called the first birthday ( though in the old days in Japan the child would have been considered at least two on his first birthday!). The reason for this is probably because in the days of high infant mortality, a child surviving his/her first year was something truly special to celebrate. This event has been ( and still is) called HATSU TANJO (初誕生), in Japanese, and there is a very unique way of celebrating the occassion ( though there are several variations in the customs depending on region and family). In its most common form it is called ISSHO MOCHI (一升餅). One SHO (升, about two kilograms) of sticky rice is pounded into MOCHI- large round cakes ( now these are usually ordered from a shop), and then , most typically, these are wrapped up in a FUROSHIKI ( a medium sized cloth) and then TIED ONTO THE ONE YEAR OLD CHILDS BACK! This is quite a heavy load for a one-year old to bear, and they are sure to cry, or at least KVETCH. 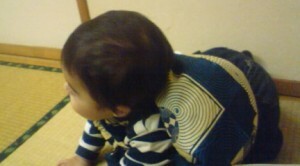 It is usually up to the parents to help the child stand for a few seconds, and maybe prop him/her up againt the wall ( being VERY careful that the furoshiki is not putting pressure on the child`s neck!). After this is done, the child`s future occupation is divined by laying out a few objects and waiting to see which one he/she picks out. Traditionally, these have been an abacus, a writing brush, and a scythe, etc. for a boy, and scissors, a book and a pin case, etc. for girls. These days, however, families can have fun by putting out all kinds of things representing different fields and occupations. In the old days this was usually a major event with a wide range of relatives, neighbors and good friends being invited for the ceremony and a festive meal. Now it is more usual to have just the nuclear family, or perhaps the grandparents, and aunts and uncles on hand for this unique and amusing event. As is so often the case when taking a closer look at specific aspects of Japanese culture, the Issho mochi custom also proves to be suprisingly fascinating with multiple layers of symbolic meaning as well as anthropological significance. First lets look at the name of the ceremony- Issho mochi. While written with the characters 一升、this means two kilos of rice, but written with different characters- 一生, the same sounds mean- ONES WHOLE LIFE. Thus, by this connection of similar sounding words ( goro awase), the ceremony takes on the significance as a prayer for good health and prosperity for the childs ENTIRE LIFE. The discomfort brought on by the sudden yoking of the child to the rice cakes can also be said to signify an introduction to the future challenges which lay in store for the child as it grows older. Its like saying- this is what life is like, kiddo! When the child falls down on his/her backside after having stood for a second or two, it can be said that the child`s impurities are washed away. This is obvious once again from a play on words- because in the Japanese ridding oneself of impurities is called YAKU OTOSHI (厄落とし) and OTOSHI also means to drop or fall. Thus when falling down with the purifying rice cakes, one is spiritually cleansed. The heavy weight making it difficult for the child to stand has another signicance as well. 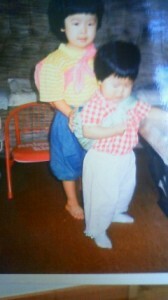 It is an expression of the parents desire that the child not grow up to soon. Besides the similar feelings shared by many parents around the world regarding fears that their children will grow up TOO FAST, in traditional Japanese thought this had a unique twist. No matter what the origins and symbolisms of this ceremony, the most important thing is that it is lots of fun for everyone, and a great chance to take pictures, celebrate the one year olds growth, and pray for his/ her future health and happiness. Cooking up the mochi rice cakes later can be fun ( and tasty), as well. That Screwy Flower- the Nejibana (捩花)! This is the first time I came across this celebration for a child. A Korean friend once told me that it is a Korean custom for a child to pick an object laid out to decide his/her ambition. Didn’t know the Japanese used to have that. Alice, an interesting thing that came to my mind was that while in Korea and Japan the future can be divined according to certain items that one selects out of many, I have heard of the same method of divination, used in Tibet or Nepal, to determine what a persons PAST LIFE WAS. I am talking specifically about the method used to select the Dalai Lama in Tibet and the Kumari ( Living Goddess) in Nepal. 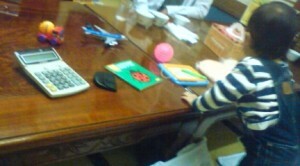 In both cases a child is put into a room which contains many objects. If a child selects the correct items it proves that he (and she respectively) are thebodies containing the reincarnated souls of past Lamas or kumaris. Since the Shingon and Tendai sects of Buddhism are related to Tibetan Buddhism ( all having descended from the same source) it is understandable how this form of divination is spread throughout the area in which these sects spread. However, in Japan it used to predict the future, while in Tibet, to determine ones past. Understood the word “ISSYOUMOCHI”. Cool! One thing that crossed my mind is that I’ve never heard of the Chinese practicing this custom. This type of divination was practiced also in China. A famous example is in the 18th century novel 紅楼夢　（こうろうむ）(Hong Lou Meng in Chinese) in which the protagonist 賈宝玉 (か・ほうぎょく) (Baoyu in the original) on his first birthday ignores all the scholarly and other implements that had been placed in front of him and reaches instead for a vial of girl’s cosmetics, a well-fulfilled premonition of his growing up to be a rake.